Esports Arena announced on Monday that it would be hosting a Smash Masters League, with events spanning the globe from Santa Ana, California, to Beijing, China. As a major esports player, ESA making an investment in Smash should have been met with rapturous appreciation. Instead, the community cried out against it. ESA, for one reason or another, had scheduled the first event of the league for the weekend of March 24, the same day as proven and well-supported grass roots event Full Bloom 4. Figureheads and players alike saw the double booking at best as ignorance of the scene, and at worst as deliberate sabotage. After a 24-hour outcry, ESA announced Tuesday that they had shifted their plans: Rather than host events for both Melee and Smash 4 at their March event, they had dropped Melee from the event so as to avoid sapping community members from Full Bloom 4, a primarily Melee-focused tournament. 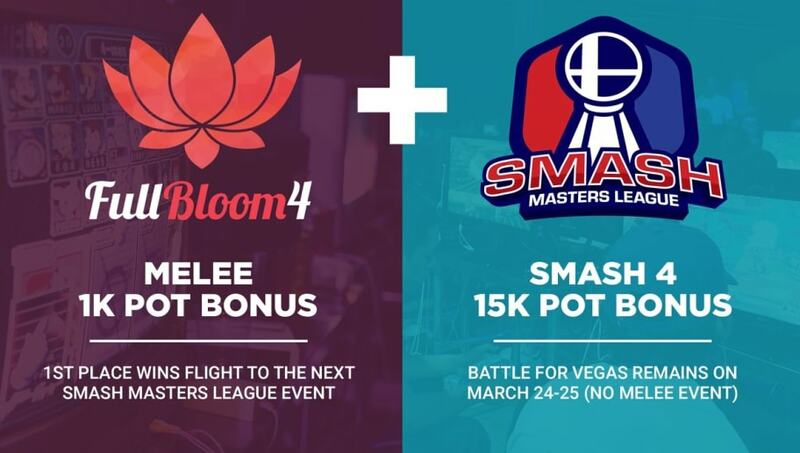 Additionally, ESA announced they would chip in a $1,000 pot bonus for Full Bloom's Melee competition, and that the tournament's winner would win a flight to the next Smash Masters League event. Glad to see a compromise. I am also hoping that there will still be a $20K event for Melee in the circuit. This solution allows the grassroots Full Bloom flourish without taking away from the grandeur and potential of a Melee circuit. Community members across the board have applauded the compromise. The first Smash Masters League event to feature Melee will take place the weekend of April 7 at the Esports Arena in Oakland, California.